Chadler Alan Williford, better known to many of us in the coin world as munkeyman95, passed away April 30, 2010 at the age of seventeen years old. Chad had joined our world of coins on the NGC and PCGS boards several years previous to his death and grew not only as a numismatist, but also as a young man in that time. I was fortunate to have an early interaction with Chad that led us to send messages to one another fairly frequently and allowed me to watch as he became more logical, analytical and passionate about numismatics and from afar to see him grow. Chad liked to play around on the boards and some might have interpreted that as lacking discipline or a serious nature, but he was able to apply himself to many subjects and would have been spectacular at near anything he could have chosen if given the chance. When I read Chad had passed away I could not believe it; could not believe that someone so young and talented and vibrant with such passion and potential could be gone without recourse. Unfortunately, this was the case. I bookmarked his obituaries at Apex Funeral Home and the News & Observer, but the impermanence of the internet has removed them in the intervening years. I never met Chad in person and his life in North Carolina was a bit removed from mine in New England, but I did visit his obituary on occasion to have a short moment of silence. Sometimes, I even spoke to him briefly. Early in Chad's online numismatic journey he purchased an exquisitely original Capped Bust quarter from me. The coin was raw and I had only shortly before that time obtained it from a show in MA. He loved the coin and surprised me by not only having it sent to PCGS for certification, but also by paying to get TrueView images taken. 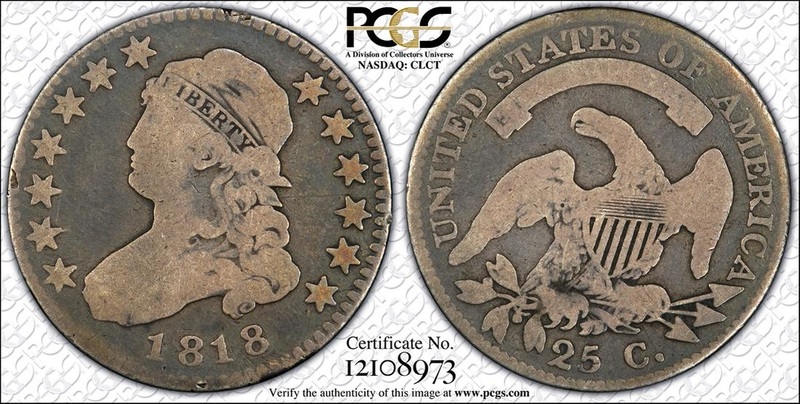 The coin was graded by me as a G6 and by PCGS as VG8, but that didn't matter to either of us because we both thought it was a simply gorgeous piece of American history. He was concerned about the planchet flaws near the edge, but I told him PCGS would grade the coin. Later, he needed to raise some quick cash and so the coin was sold, but he regretted selling it and posted on the boards that he missed the coin and that it might have been his favorite piece. Opportunity knocked on his door and he purchased the coin again, only to be forced a short while later to again list it for sale. I purchased the coin from him, but told him to keep the coin as a gift from me to him; he was quite touched by the gesture. Later, in another financial pinch, he was again forced to sell the coin. The last time he sold the coin was shortly before he passed away. I posted a thread on the boards asking for assistance in obtaining this particular piece and was finally able to reacquire this favorite coin. For several years I had brought this coin to shows with me and whenever I had a table it was displayed in the middle of a case with "NFS" (Not For Sale) listed under the slab. Invariably, this caused multiple show patrons to ask about the coin wondering if it was a difficult variety or what the story attached to the coin might be. I would then tell them about this young man whom I knew, who had so much to live for and who was so well equipped to handle a variety of challenges, but who never had the opportunity to explore the world and find his niche. It has brought tears to the eyes of strangers, has led to handshakes and to quiet moments. Following several years around the country on the show circuit, I sent the coin to Chad's family so that they might retain this favorite piece from his collection. Chad might be gone, but he is not forgotten and I hope he is on a greater journey. Good bye, my friend, and take care.